IQS Directory provides a detailed list of stainless steel silo manufacturers and suppliers. Find stainless steel silo companies that can design, engineer, and manufacture stainless steel silos to your specifications. Peruse our website to review and discover top stainless steel silo manufacturers with roll over ads and complete product descriptions. Connect with the stainless steel silo companies through our hassle-free and efficient request for quote form. You are provided company profiles, website links, locations, phone numbers, product videos, and product information. Read reviews and stay informed with product new articles. 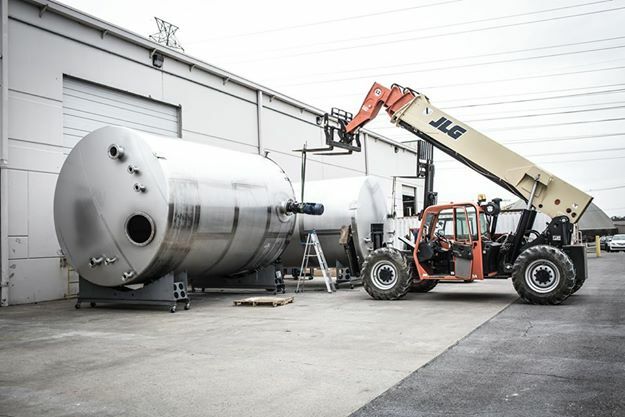 Whether you are looking for manufacturers of ss storage silos, grain silos, and custom fabricated steel silos of every type, IQS is the premier source for you. Whether you are looking for a single tank or an integrated system with automated filling and discharge features we have the products to meet your needs. Our stainless steel tanks are designed for corrosion resistance and these uncompromising solutions will last you for many years to come. We are a forward thinking company who strives to provide you with the highest quality products. Turn to Frain Industries, Inc. for outstanding stainless steel silos. G & F Manufacturing Company is dedicated to supplying our customers with the strong stainless steel silos. You can trust us to handle the most complex projects and we ensure our clients that these industrial tanks will not fail. These versatile units are equipped to handle a large variety of applications expanding across many industries. Our field services are unsurpassed and we work hard to meet all of your needs. Contact us today! Buckeye Fabricating is dedicated to supplying our customers with the strong stainless steel silos. You can trust us to handle the most complex projects and we ensure our clients that these industrial tanks will not fail. These versatile units are equipped to handle a large variety of applications expanding across many industries. Our field services are unsurpassed and we work hard to meet all of your needs. Contact us today! Since 1986, Springs Fabrication, Inc. has been serving the needs of companies nationwide with superior manufacturing. A commitment to delivering high-end engineered metal products to a wide range of industries has been the cornerstone of continued success. Contact Springs Fabrication today for quality stainless steel storage tanks or for any questions you may have. SF, Inc. has got your back! Stainless steel silos are large cylindrical storage structures made of steel alloyed with a minimum of 10% chromium and other alloys. The ratios of the materials vary the characteristics of the stainless steel, and there are hundreds of grades; silos are most frequently constructed of 304 and 316 stainless steel. Of the three types of silos—tower, bag and bunker—stainless steel tower silos are the most widely used. Mainly found on a farm and used in the agricultural industry to store crops or animal feed, known as silage, stainless steel silos range in size and capacity, sometimes containing hundreds of tons of storage. Silos are typically the largest stainless steel storage container on the market, ranging from 10 to 90 feet in diameter and 30 to 275 feel in height. Because stainless steel is easy to clean and has no pores that would absorb or release impurities, these silos are used in the chemical, food processing, mining, pharmaceutical, plastics and water works industries holding substances like milk, crushed limestone powder or corn seed. Stainless steel is an effective conductor of thermal heat and resists high temperature oxidation which makes it suitable for outdoor use in many different climates. It’s a versatile and common metal that is resistant to corrosion, staining, peeling and cracking. The familiar cylindrical shape of these silos is meant to resist hydraulic pressure, and they always contain at least one manway, or opening, for pressure control. The process of constructing a stainless steel silo begins with steel, an alloy metal consisting mostly of iron. Chromium is added to the metal; the percentage of chromium determines the grade and corrosion resistance of the final product. Steel and the alloys are melted together in an electric arc furnace and then annealed, a process that alternately heats and cools the steel until hardened. A thin flexible layer of chromium oxide forms on the outside surface, coating it and in essence sealing it off from abrasive substances. For a silo, the stainless steel is roll-formed. A long strip of stainless steel is fed through a series of rollers that gradually bend the steel into shape. Since the stainless steel is worked in a cold state, the results are typically lighter and stronger than if the steel had been stretched while hot. After the large curved sheets are cut and prepared, they can be fastened together with bolts or welded, which ensures a seamless watertight construction. If the size allows it, silos are transported on a special delivery truck and then erected by a crane. Depending on the intended use of the silo, a 45 or 60 degree stainless steel cone can be fitted on the bottom to allow a consistent flow of material. Other nozzles, doors, pipes and fittings are added; some silos require heating, refrigeration or have an agitator installed. The stainless steel silo can sit on the ground or be supported on a stand to allow for easy access to the material inside. The stands vary in size and strength as well as design and can be elevated, legged or skirted.